Due to the rising hashrate of the bitcoin network caused by the introduction of ASICs to the market, GPU mining Bitcoins has become impracticable. The hashrate of most GPU units is below 1GH/s, and as of 2014, some single ASIC units are able to reach speeds of over 1,000GH/s while consuming far less power than used by a GPU. The information in this table is preserved for historical interest, but does not include many GPUs which were released after the advent of ASIC mining. Stream SDK 2.5 seems to have resolved many of the problems with earlier versions. Everyone's setups will be unique so this should only be a guide or starting point, not an absolute. 4350 8.14 - 0.19 - 730 80 2.4 PCI-E 2.0 x16 Diablo/Windows7 -w 32. Model: Asus EAH4350 Silent. Memory at 400MHz. Runs at 60°C with ambient at 25°C. 4570M 9.6 0.300 ? 32 825(OC) 80 - PCI-E 2.0 x16 Diablo/Windows7 -w 64, SDK 2.4, Cat 11.4. Model: Sony Vaio NW. OC core 680->825. U/C memory 800->500. 4870 88 140 std 800 12.3.6 PCI-E 2.0 x16 phoenix 1.50 / 64bit OS X pyopencl / poclbm Standard Mac Pro 3,1 with Apple HD4870 upgrade. Flags: FASTLOOP WORKSIZE=64 AGGRESSION=5 (don't use vectors, and hash rate drops to 60-70 if browser windows are visible, speeds up to 88 if you hide them! 4870 104.2 ? ? 830(OC) 800 2.1 PCI-E 2.0 x16 poclbm Windows 7 64-Bit, GPU Core OC to 830 MHz, GPU Memory UC to 200 MHz By MSI AfterBurner. Card: Gainward Golden Sample. @70%Fan we have 55 GPU temp. 5450 13.74 - - 700 - - PCI-E 2.1 x16 poclbm/Linuxcoin v0.2 -v -w128 tried several options, seems to work best. 5450 14.12 - - 700 - - PCI-E 2.1 x16 Phoenix/Linuxcoin v0.2 Flags: "DEVICE=0 VECTORS AGGRESSION=4 -v FASTLOOP BFI_INT WORKSIZE=64" Kernel: "phatk"
5550 62.10 - - - 700 - - PCI-E 2.1 x16 Phoenix 700MHz core 800MHz ram, phatk mod, Flags: "-k phatk worksize=128 vectors aggression=4 bfi_int"
5830 275 1.5714 175 900 500 2.1 PCI-E 2.1 x16 poclbm (guiminer) Win7x64 -v -w64 -f10, XFX stock w/ v2.4 SDK = 230Mh/s, v2.1 SDK = +10Mh/s, overclocking core clock by 100 = +30Mh/s, underclocking memory to 500 (ran cooler), and changing workload to -w64 = +5Mh/s. 5870 458 - - 1040 1600 2.1 PCI-E 2.0 x16 poclbm/Windows 7 64 -v -w 256 -f 1 Crossfired, Water cooled, 916 Mhash/s total. Best dual gpu setup me thinks? The name is Mautobu. 6770 221 - - 1010 300 2.4 PCI-E 2.0 x8 Phoenix 1.50 MSI 6770 -k phatk PLATFORM=0 DEVICE=0 VECTORS BFI_INT WORKSIZE=256 FASTLOOP=false AGGRESSION=13 3% Stock voltage. 6770 235 - - 1010 300 2.4 PCI-E 2.0 x8 Phoenix 1.50 Sapphire 6770 -k phatk PLATFORM=0 DEVICE=0 VECTORS BFI_INT WORKSIZE=256 FASTLOOP=false AGGRESSION=13 3% mod https://forum.bitcoin.org/index.php?topic=22965.0 and AS5 paste on core w/ external 12" fan 50C full load. Stock voltage. 6770x2 470 - - 1010 300 2.4 PCI-E 2.0 x8 Phoenix 1.50 Sapphire 6770 -k phatk PLATFORM=0 DEVICE=0 VECTORS BFI_INT WORKSIZE=256 FASTLOOP=false AGGRESSION=13 3% mod https://forum.bitcoin.org/index.php?topic=22965.0 and AS5 paste on core w/ external 12" fan 50C full load. Stock voltage. 6870 295 2.02 1.64 146 950 1120 2.4 PCI-E 2.1 x16 hashkill latest as of 7/6/11 (ubuntu 11.4) hashkill-gpu -p bitcoin user:pass:server -D, mem clock 850, voltage @ 1.175, Fan @ 70%, Temp @ 71C. 6870 312 - - 975 300 2.4 PCI-E 2.1 x16 phoenix 1.50 / phatk / Windows 7 x64 SP1 VECTORS BFI_INT AGGRESSION=11 FASTLOOP=false WORKSIZE=256, mem clock @ 300MHz, voltage @ 1.300, Fan @ 45%, Temp @ 62C, MSI 6870 HAWK. 6870 332 - 1.74 - 1050 1120 2.4 PCI-E 2.1 x16 guiminer 2011-06-14 using phoenix (Win7-32bit) -k phatk platform=0 device=0 VECTORS BFI_INT AGGRESSION=13 worksize=128 FASTLOOP=false, mem clock @ 228MHz, voltage @ 1.3, Fan @ 60%, Temp @ 74C, flash and browser hardware acceleration disabled, aero enabled. 6870x4 1180 - - 145 950 1120 2.4 PCI-E 2.1 x16 poclbm/debian32bit -v -w128, Gigabyte SOC. voltage 1.175 (default), GPU default 950 MHz, Mem downclocked to 300 MHz, Fan 4x100% (+ 2x12cm fun 1300rpm), Temp 4x75C (in summer). 6870x4 1200 - - 150 970 1120 2.4 PCI-E 2.1 x16 poclbm/debian32bit -v -w128, Gigabyte SOC. voltage 1.175 (default), GPU overclocked from 950 to 970 MHz, Mem downclocked to 300 MHz, Fan 4x100% (+ 2x12cm fun 1300rpm), Temp 4x75C (in summer). Unstable with GPU@975 MHz. 6950 344.4 - - 800 1536 - PCI-E 2.1 x16 guiminer/poclbm Powercolor 6950 @ shadermod on original Bios 6950 / 1000mV 850/730, +20% powertune, Fan @ 60%, -v -w128 -f1. 6950 352.8 - - 820 1536 - PCI-E 2.1 x16 guiminer/poclbm Powercolor 6950 @ shadermod on original Bios 6950 / 1000mV 850/730, +20% powertune, Fan @ 60%, -v -w128 -f1. 6950 366.4 - - 850 1536 - PCI-E 2.1 x16 guiminer/poclbm Powercolor 6950 @ shadermod on original Bios 6950 / 1000mV 850/730, +20% powertune, Fan @ 60%, -v -w128 -f1. 6950 381 - - 850 1536 - PCI-E 2.1 x16 cgminer/phatk XFX 6950 2Gb reference @ shadermod on original Bios 6950 / 1100mV 850/1250, +10% powertune, I=5, Fan @ 54% ~3100RPM, temp 73C w128. Windows7x64, Catalyst 13.1 . 6950 388.4 - - 900 1536 - PCI-E 2.1 x16 guiminer/poclbm Powercolor 6950 @ shadermod on original Bios 6950 / 1000mV 850/730, +20% powertune, Fan @ 60%, -v -w128 -f1. 6950 400~ - - 895 320 1536 PCI-E 2.1 x16 GUIMiner 24th Aug 2011 Sapphire HD6950 Shader unlock mod 1408>1536 / +20% Power control, Fan @ 55%, Flags:-v -f2 -w64 -r5.Note this keeps temps under 80oC which is needed for this to be stable.Moderate fan noise.Power use is ~200W. 6950 410.4 - - 950 1536 - PCI-E 2.1 x16 guiminer/poclbm Powercolor 6950 @ shadermod on original Bios 6950 / 1000mV 850/730, +20% powertune, Fan @ 60%, -v -w128 -f1. 6950 432.4 - - 1000 1536 - PCI-E 2.1 x16 guiminer/poclbm Powercolor 6950 @ shadermod on original Bios 6950 / 1000mV 850/730, +20% powertune, Fan @ 60%, -v -w128 -f1. 6950 454.4 - - 1050 1536 - PCI-E 2.1 x16 guiminer/poclbm Powercolor 6950 @ shadermod on original Bios 6950 / 1000mV 850/730, +20% powertune, Fan @ 60%, -v -w128 -f1. 6970 323 1.468 0.92 220 880 1536 2.3 PCI-E 2.1 x16 poclbm -w 64, SDK 2.1 not supported on 69xx. 6990 670 1.94 0.89 346 830 3072 2.4 PCI-E 2.1 x16 poclbm Catalyst 11.4 source. 6990 771 1.8804 410 880 3072 2.3 PCI-E 2.1 x16 mrb's hdminer SDK 2.1 not supported on 69xx. Memory clock @ 1280Mhz. 6990 795 - - - - 2.4 Diablo's miner BIOS switch at "overclocked" position 1; On Windows Vista, Clocks set at 955,1250. Power control at 20. 6990 865 - 1.11 - 890/860 3072 2.4 PCI-E 2.1 x16 cgminer BIOS switch at "overclocked" position 1; with core 0 at 990/890 engine/mem, core 1 at 960/860 (runs hot). Watercooled at 65-68C. 7870 405 - - - 1100 1280 2.6 PCI-E 2.0 x16 Guiminer Sapphire 7870 OC , GPU: 1100MHz, Mem: 950 Mhz, GPU temp: 65°C, Fan 36% (1377 RPM). 8200 mGPU 1.2 1200 16 128 MB shared memory, "poclbm -w 128 -f 0"
8400 GS 2.3 "poclbm -w 128"
8800 GTS 33.5 150 OC CUDA mining via GUIminer. Win7 64bit. poclbm -v -w128 -f0. OC'd Core@799MHz, Mem@1080MHz, Shader@1905MHz. Fan 70%, GPU temp @ 66C in comfortable room temp. GTX260c216 OC 52.0 1461 216 "poclbm -w 256 -f 1"
GTX260c216 OC 58.9 756/400 216 Core overclocked, Memory underclocked, Ubuntu 11.04 Classic Session(No Effects) "poclbm -w 256 -f 1"
GTX260c216 OC 60.1 1706 216 Core: 364 MHz, Shaders: 1706 MHz, Memory: 594 MHz, VDDC: 1.1800V. "poclbm-mod -w 256 -f 1"
GTX295 120.70 0.418 289 1242 480 GUIMiner no oc. GT 330M 10.8 650MHZ core 48 Model: MacBookPro6,2 VRAM: 512MB Software: GUIMiner running in Bootcamp v2011-08-24 / Mac OS X 10.6.8.The GPU was OC'd to 650MHZ core clock,mem clock was the lowest it would go in MSI Afterburner.The Bootcamp OS was Windows 7 x64.MBP Mid 2010. GTS 360M (ASUS G60jx) 20.0 everythins is stock, it cannot sustain. it reaches 90 degrees and freezes. GT610M (ASUS K45V) 9.371 738 MHz 2GB RAM. GTX460 768MB (MSI Cyclone 768D5/OC) 75.1 ? 930 336 rpcminer-cuda on Win7 x64 with ForceWare 275.33. 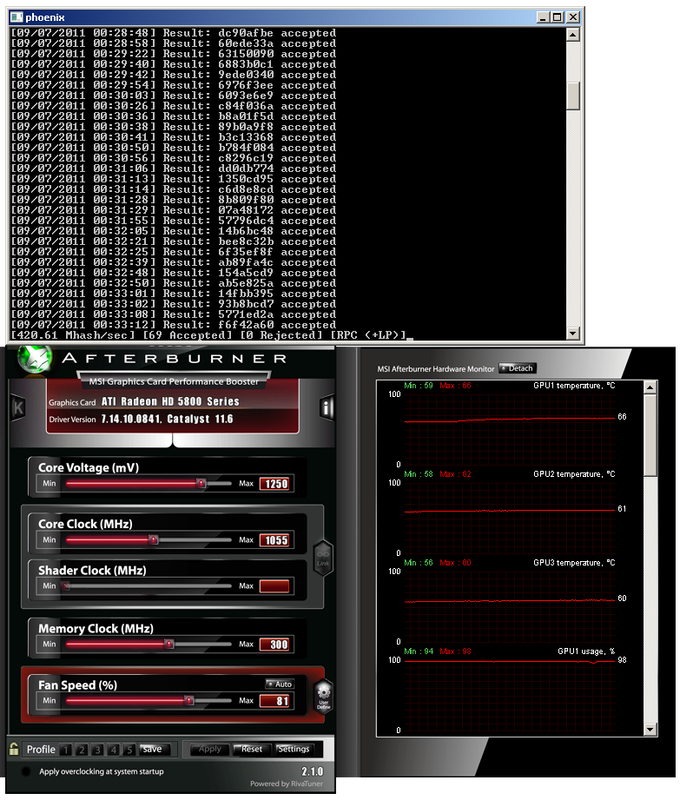 MSI Afterburner set to core: 930MHz, shader: 1850MHz, core voltage: 1.087V, memory: 1600MHz. Runs at 58°C with fan at 75% (ambient 25°C). GTX460 1GB OC (2x MsiHawksSLI) 158 0.658 240w(used kill a watt) core/shader/ram@vcore 930/1860/1150@1.087v (only vcore raised) 2x 336 rpcminer-cuda ver.20110227 -gpugrid=320 -gputhreads=320 -aggression=7 Watercooled stable @ 110°F/43° !! !USE ASUS GPU Tweak with GPU-Z (afterburner v2.2.3 wont OC with NVIDIA driver 306.97) I would need gpu bios mod to get more oc/volt. Setting faster ram did increase Mhash/s versus setting ram=core clock. GTX560 Ti 100 0.5 200 1000 384 GFX - MSI 560Ti HAWK; rpcminer-cuda.exe -aggression=8 -gpugrid=64 -gputhreads=384; GPU temp - 68°C; OS - Windows 8 x64 . GTX570 165 925 480 rpcminer-cuda.exe -gpugrid=120 -gputhreads=960; vcore 1.1v; Win7 x64 304.79 Beta; -aggression=11 adds strong lag with minimal increase in hashrate. GTX680 110.00 1110 1536 RPCMiner with OpenCL or others. Might crash once mining stops. No Flags and Stock Settings (GPU Boost @ 1110mhz Core) with EVGA GTX 680, latest version of GUIMiner (2012-2-19) and Windows 7 x64. GTX680 120.00 1.2 100 1272 1536 Ufasoft Galaxy 4GB (GPU Clock offset +70Mhz with EVGA Precision X) (2012-7-28) and Windows 7 64-Bit. A lot of nice data can be pulled from this thread to seed this section. Might you wish to throttle CPU load a bit, so it doesn't reach 100°C, it can be done with Battle Encoder Shirase to a margin, like, -15% of available CPU cycles. Often, the best combination to be is to throttle CPU miner to -5% AND set it to least of priority levels, so as not to choke GPU miner up. Phenom II X4 810 4 11.5 95W 2.8 GHz cgminer 1.5.3 "cgminer 1.5.3 --algo 4way" on Ubuntu 11.10 alpha 2 (64 bit), built by GCC 4.6.1 with "-O3 -Wall -march=native"
A8-3850 4 60 100W Stock 60 HD6550D Stock 400 poclbm.exe, Win7-32, 4GB RAM All running at stock speeds, and set to auto in BIOS. Cortex-A9 2 1.3 ? ? ? 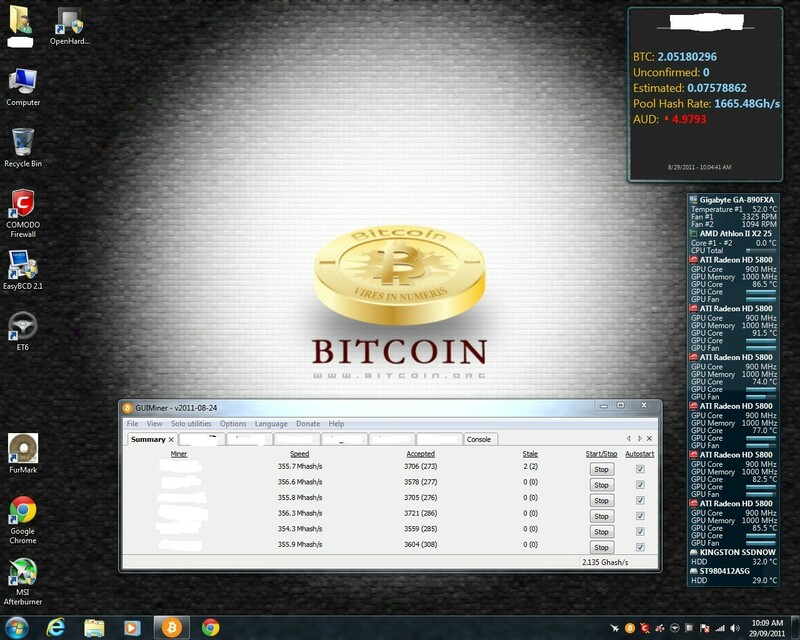 1.2 GHz pooler's cpuminer 2.2.3 Samsung Galaxy S II - CFLAGS="-O3 -mfpu=neon"
Celeron E3400 2/2 5.9 - - - 2.6 Ufasoft v0.13 / GUIMiner v2011-06-14 WinXP 32 bit, SSE2, Flags "-g no"
Core i7 620M 2/4 6.5 3.33 This is achieved by running RPC 4 way miner in VMware Fusion 4 (running win 7 in the VM) while in Mac OSX / Mac OS X 10.6.8 Model: MacBookPro6,2 RAM: 8GB.The CPU appears to turbo boost to 3.33GHz in this way from 2.67GHz when running it in this way.The MBP gets very hot and uses a lot of energy though so watch those temps.It'll throttle after a while unless you keep the air vents clear underneath (ie don't put int in your lap,etc). Cell 6 21 0.35 0.07 60W 3.2 GHz Cellminer Sony Playstation 3 (FAT): Needs custom firmware. source source Total power usage of PS3 fat is 120W but only the Cell cpu is active. Cell 7 26.6 ? ? 60W 3.2 GHz Cellminer Sony Playstation 3 (FAT): Needs custom firmware. source source Running with 7th spu enabled and both ppe cores. Cell 6 21 0.7 0.07 35W 3.2 GHz cellminer Sony Playstation 3 (SLIM): Total power usage of PS3 slim is 70W but only the Cell cpu is active. Google App Engine 1 0.144 0W pyminer Modified version of pyminer for GAE. This page was last modified on 29 March 2018, at 05:35.